Midway through coffee a soldier came running in. ‘Tzeva adom!’ ‘Red colour!’ Cups clattered, chairs shrieked across slate floor. There is a calm exodus to an improvised bomb shelter — the cafe’s concrete reinforced bathroom. Soldiers at the front, paramedics behind, civilians at the back. Two dozen faces are lit by the insistent flashes of Red Alert, an app that warns of incoming fire. The foreigners quip nervously, the locals tut at the inconvenience. After a few minutes, the all clear is given and diners return to their lunch. It is 1.02pm and another rocket has just hit Israel. We are at Yad Mordechai junction, four kilometres from the 1949 armistice line — the border between Israel and Gaza. This is the second time in 30 minutes that we have had to flee from a Hamas rocket. Both times, a public announcement system sounded: the factual tone announcing ‘red colour’ is deemed less psychologically damaging than constant air raid sirens. Iron Dome, Israel’s anti-ballistic defence shield, took out the first rocket; the second got through and hit a house nearby. Israelis say without the Dome, casualties would be much higher and the government would have no option but to launch another full-scale military offensive against Hamas. Scores of injured Israelis have been taken to hospitals in the borderland in recent days. On Tuesday morning, Hamas’s rockets claimed their first fatality this week: Mahmoud Abu Asabeh, a 48-year-old Palestinian working in Israel, was killed when a projectile hit his apartment building in Ashkelon. He leaves behind a wife and five children. The tense ceasefire between Israel and Hamas looks likely to survive Sunday’s botched IDF operation inside Gaza, which cost the life of a senior Israeli officer (named only as ‘Lt. Col. M’) and seven Palestinians. The Israelis’ story is that this was a routine intelligence operation gone wrong but there are reports that this was a botched assassination attempt. 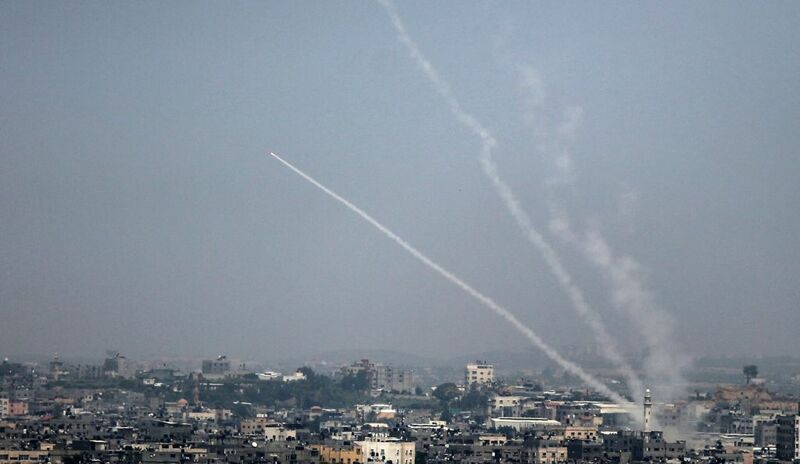 Wherever the truth lies, Hamas exacted its revenge as always on Israeli civilians, targeting them with hundreds of rockets, and prompting a response that has killed seven Gazans, according to the Palestinian Ma’an News Agency. Israel’s hawkish defence minister Avigdor Liberman resigned on Wednesday, in what is thought to be an act of political positioning ahead of rumoured elections. I travelled to Israel this week as part of a delegation of British journalists invited by the country’s ministry of foreign affairs. With the government picking up the tab, I feared that it might be one of those pointless junkets where diplomats spin the usual lines: Israel the Victim, Israel the High-Tech Eden, and Israel the Only Democracy in the Region. Instead, we have been given remarkable access to police, senior diplomats, policy-makers and politicians. Checkpoints, anti-Arab racism, the Nation State Law — nothing has been off limits. They have pushed back, sometimes hard, but there has been little glossing over Israel’s faults. This candour is what makes us insist on visiting the Gaza border as scheduled: here is a chance to test all they have told us. Our planned visit to the Kerem Shalom border crossing is now out of the question, a pity because Kerem Shalom is busy. Israel is sending tankers of fuel and trucks with essential supplies into Gaza. After some pushing, our hosts agree to take us as close to the border fence as possible. We rattle down a highway on which all the other traffic is heading in the opposite direction and, after an hour, arrive at Sapir College, just outside Sderot. Sapir has 8,000 students on its roll — 7,000 Jews and 1,000 Arabs or Bedouins — but today the campus is a shell. The authorities shut it down briefly on Tuesday because it is in range of Gaza, before it was reopened. The building is also a literal shell: the college is surrounded by a forbidding concrete barrier designed to look like the walls of the building. Inside the education fortress we meet Zohar Avitan, the director of academic studies, who has been at the college since 1977. A lively-humoured man, his jokes are punctuated by a regular lament about the absence of his students. Avitan speaks of them with grandfatherly affection, especially the Bedouin women he says have to sneak out to classes every day lest their husbands find out. Sapir is to him ‘the wondership — the ship of dreams’, where students can find their way in life. Before the second intifada, Sapir had a sizeable contingent of Gazan students and ran courses inside the Strip. ‘This was back when we believed in peace,’ Zohar says. He is sad but he is not bitter. His parents, Moroccan Jews, moved to Israel when he was one and the family lived in a 32-square metre house in Sderot. He is proud of his town, recalling how it was known as ‘the Liverpool of Israel’ in the 1980s for producing a succession of chart-topping artists. Zohar has an old man’s impatience for ideology. ‘This question of who started it. He started it; no, he started it. This is the argument of the kindergarten. We cannot live in the past; we have to build the future.’ The Palestinians, he states many times, are not his enemies. He wants one of his students to become manager of the duty free between Gaza and Israel. ‘That day, we’ll throw Toblerones, not missiles’. He takes us into central Sderot. It is a town of 24,000 and lies 800 metres from Gaza. Zohar introduces us to the mayor, Alon Davidi, a forty-something religious man and a smooth, easy political operator. He guides us into the municipality’s security command centre with its wall of CCTV screens and bank of telephonists fielding calls from concerned residents. The atmosphere is wire-taut; Red Alert buzzes with every fresh rocket that lands nearby. Davidi breaks the tension by saying he hopes for peace in Sderot — and continued success for the English national football team. I ask him about the psychological effects of rocket attacks. Israeli children living in the border communities report markedly higher mental health problems than the rest of the country. Three of Davidi’s children have been diagnosed with post-traumatic stress disorder. The town runs a number of programmes to help youngsters manage anxiety; his children have a therapy pet, a dog called Mocha. It helps them handle the enduring fear of the next barrage. Next we arrive at a bakery in the centre of town. A rocket landed the night before and struck a gas canister, incinerating the back of the shop. The stench of carbon attacks the nostrils. The baker is inside, now baking in the front of his shop because he cannot afford not to work. Out the back, insurance assessors fill out their forms, stony-faced. We drive closer still to Gaza, heading to the Black Arrow memorial that commemorates an earlier, more successful Israeli incursion. We can see the tops of Gaza tower blocks on the horizon but soon we are pulled over by the IDF. At first they agree to let us take pictures then lose patience and order us to move on. Ten minutes later we turn into Kfar Aza, a kibbutz directly on the border. As we arrive, some of the soldiers there shake their heads. Idiot tourists. A short walk later, we run out of road. Before us stands the electrified border fence. Only its wire mesh, and 50 metres of agricultural land, stand between us and Gaza. The kibbutzniks still farm the land but Hamas is now sending flaming kites to burn the crops, even as the children of Gaza — but not the children of Hamas — struggle to survive on supplies driven in every week by Israel. The same children have no trauma pets, no ship of dreams. Their rulers put them in front of soldiers, not the other way round. Gaza is 50 metres and yet much farther from here. This entry was posted on November 19, 2018 at 4:26 AM and is filed under Hamas, Rocket attacks. You can subscribe via RSS 2.0 feed to this post's comments.